Serve this Strawberry Cream Cheese Fruit Dip Recipe with fruit kabobs for a side dish that everyone will love. An easy fruit dip with Cool Whip that is a make-ahead recipe for family gatherings or weeknight dinners. Every once in a while, usually when I’m hungry, I think of a random recipe from my childhood. Something my mom made or perhaps my grandmother. Both were amazing cooks. 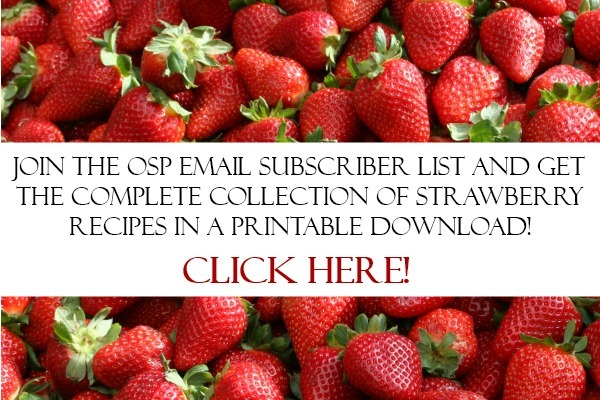 This Strawberry Cream Cheese Fruit Dip Recipe is very close to one my grandmother made for filling cream puffs. This recipe is simple, quick and has an amazing texture. It sort of melts in your mouth. It’s make-ahead and pairs perfectly with fresh fruit. It would definitely work as for filling cream puffs! I asked my dad if he remembered the recipe my grandmother used for her cream puff filling, but he did not. Our best guess was strawberries, whipped cream, and sugar. Maybe she added vanilla but we aren’t sure. The recipe I came up with is a little different, but worked perfectly and has just five ingredients. Serve this Strawberry Cream Cheese Fruit Dip Recipe with fruit kabobs for an easy side dish that everyone will love. An easy make-ahead recipe for family gatherings or weeknight dinners. Whip until strawberries are pulsed, about 2 minutes. Make sure to scrape the sides often. Add powdered sugar and vanilla. Mix just until combined. 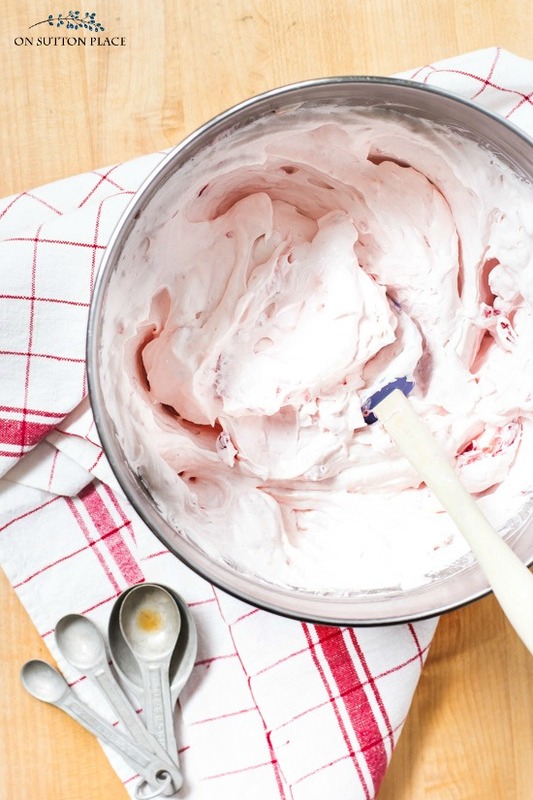 With a spatula by hand, fold the entire container of Cool Whip into the cream cheese mixture. Serve with fresh fruit, vanilla wafers, graham crackers or as a topping for angel food cake. Lasts in the refrigerator for 2 to 3 days. A fruit dip with Cool Whip! The cream cheese adds a stabilizing quality and great taste. I briefly considered using real whipped cream but decided on the old stand-by of a fruit dip with Cool Whip. Honestly, I love Cool Whip and if you wanted to cut a few calories you could use Cool Whip Lite. 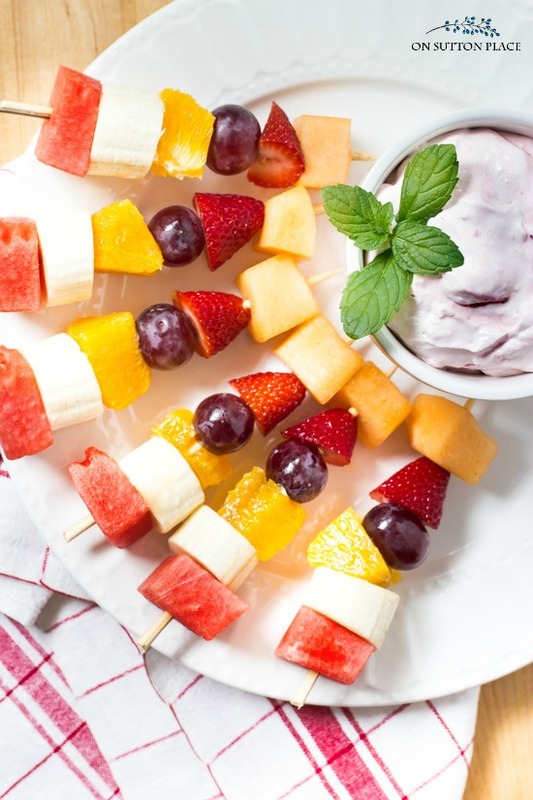 Serve this fruit dip recipe with fresh fruit, but it can also be used in a variety of other ways. As a filling for an icebox cake. 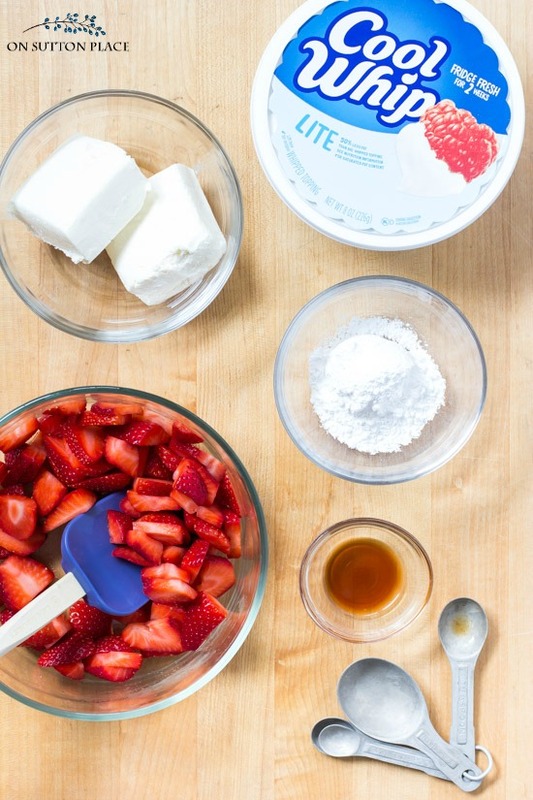 Just make this Strawberry Icebox Cake but substitute this recipe for the Cool Whip. As a filling for cream puffs! Easy but delicious recipes like this one are perfect for today’s families with busy lives. All of us would like to serve food made from scratch, but some days there just isn’t enough time. Recipes like this make that possible. Using this for my wedding fruit kabobs. Thank you. Love your site 😊. I attempted the daisy wreath for my front door looks so cheery . Sounds good – I’m going to try it over summer. Thanks! Here is my moms recipe. . It might be the one you were looking for. .
container of cool whip ..
That looks so good and perfect for the season. Thank you for sharing.